„When you are destroying alliances you are going to be left behind“ - Atlantik-Brücke e.V. The three American college students Sophie al Mutawaly, Samuel Rahlke and Krister Lansing are currently doing internships in Germany. During a visit to Berlin, they discussed the state of transatlantic relations with Atlantik-Brücke, giving the perspective of a younger generation. They all expressed hope that the United States and Europe will overcome their current differences and focus more on the long-term strategic objectives of their partnership. What does the transatlantic relationship mean for your personal life? Sophie al Mutawaly: For me it is very important and a big piece of my life. Being born in Germany and having grown up in the United States in a German household, my life has been very transatlantic. I am majoring in Government and Legal Studies, so the transatlantic topics that are being discussed and change every day are very relevant to both my personal life and what I am studying. Samuel Rahlke: I am in a similar role to Sophie. I have been coming to Germany my entire life. I have family here. I was less than one year old the first I was here. Studying German as a foreign language helps me to connect with my family and other Germans. I really want to come here and work here for a few years. Or who knows? Maybe I will even end up living here for the rest of my life. Krister Lansing: I definitively echo Sam’s sentiment of how much I appreciate this opportunity of coming back to Germany. I have some German heritage – as many Americans do. And there is the option to study German in Germany and also to go deeper into subjects like politics. Germany and the United States share a lot of history. So, it is important to learn from each other. We can act together and solve problems since the United States and Germany have been allies and partners in so many issues for decades. The world order is changing rapidly if you think of China’s rise, Russia’s attempt to expand its spheres of influence and the growing number of populist movements and illiberal, authoritarian states especially in the West. Do you have any suggestion how to maintain the transatlantic values that guided America and Europe for more than seventy years? Krister Lansing: Germany and the United States should definitively emphasize what they have in common, especially those qualities that are not really dependent on any current administration or ideology. Climate change is a good example. You could also mention the securing of the sovereignty of nation states, world peace and international aid. These things should be held in high regard. Ideology should be pushed aside. Politicians on both sides of the Atlantic should rise above these short-term issues. This partnership is indelible. Sophie al Mutawaly: I agree with that. Keeping in mind that Germany and the US are major world powers, remembering what is important for these larger goals, and keeping the relationship strong, alive, and positive will really help in the long term rather than losing or weakening it over small disagreements. Samuel Rahlke: We should really be looking to solidify our alliances rather than focusing on policies that primarily put the needs of a single nation first. When you are destroying alliances over small trade issues, you are going to be left behind big time in the international economy. That is not worth it. What is your take on the EU’s reaction to President Trump’s “America first” policy? Sophie al Mutawaly: It was interesting to look at the local side during the presidential election in 2016. Trump was able to win over people who felt like they had been abandoned by the government. Trump’s idea is to bring jobs back to America and to help those people. Although I don’t entirely agree with his philosophy, he managed to get a lot of votes that way. A lot of people within the United States do recognize that “America first” is not the policy that they want. They want to keep alliances strong and to see a united Europe. “America first” is not what all Americans think and accept. Krister Lansing: I would like to talk about the punitive tariffs and trade measures that Trump has imposed. They go against every single tenet of the international multilateral system. This is essentially a political tactic to make good on promises made during Trump’s campaign. These promises are impossible to follow through. You can’t simply just impose tariffs and expect people to get better jobs in industries that are now becoming defunct. The European Union can’t just allow tariffs to be imposed. Because otherwise you bring negative effects onto the population of the EU. Like Heiko Maas said it has to be a Europe united. Chancellor Merkel is doing a very good job in being very sober, strong and reliable and not turning over on any questions. Samuel Rahlke studies German and Pre-Business Finance at the University of North Carolina in Charlotte. He is currently doing an internship at the ACE Handels- und Entwicklungs GmbH in Freilassing. Samuel Rahlke: It is definitively important that Europe doesn’t accept these tariffs. That could encourage Trump in the future to continue to use bully tactics. Will the United States have structurally changed forever once Donald Trump has left the Oval Office? Krister Lansing: There is evidence that can support this view. The first secretary of state we had, Rex Tillerson, came into office and fired so many experienced foreign service officers. That was not prudent because these people have years of experience in one of the fundamental policy pillars. We also have the tax bill passed that will increase the income inequality in the United States. Sophie al Mutawaly: On the flip side you are also seeing a strong reaction to things that Trump is doing. In the past year the travel ban happened, there were protests all over the country. Also, the MeToo movement came up which is very Hollywood-based. But given our current political climate in the US it is very relevant with someone like Trump in the White House. Regarding the midterm elections a lot more women and young people are running like Jon Ossoff in Georgia. There is going to be a lot of responsibility on the younger generation to really turn out for votes and be active. It is important for them to fight back against these policies so that they don’t become permanent and don’t change the structure of the US. Samuel Rahlke: We are going to see structural changes in political mindsets especially of the younger generation. Trump has definitively brought in his own meaning spin in the way of campaigning and operating his office. Some have called him a demagogue. His speeches very much appeal to people’s emotions rather than logic. People are going to change the way they look at politicians who are campaigning and at what they promise to do in office. I hope we will see a shift more to the middle of the political spectrum. The current parties pursue the policies that they want rather than what is necessary and best for the country. How excited are you about the midterm elections on November, 6? Krister Lansing: It will be a milestone moment. We will see how mobilized people will get to show their approval or disapproval of Donald Trump’s policies. We have seen something similar with the rejection of Roy Moore. It will be very hard for the Democrats to take back the House and Senate. Trump is getting 40 percent of people who approve his presidency. Sophie al Mutawaly: Early on in Trump’s presidency people were really outraged. But now he was able to get this meeting happening with North Korea. For some people this must feel like a setback right before the midterm elections. But I am still optimistic that there will be a strong response from the Democratic Party to get back in the game. Samuel Rahlke: The meeting with Kim Jong-Un is tremendous! We will have to wait and see if Trump can take this to the next step to achieve bigger goals. If he can do that we may not see too much change in the House and the Senate. What hopes and fears do you have regarding domestic American policy? Krister Lansing: Trump has hired Scott Pruitt as head of the EPA (Environmental Protection Agency) knowing that Pruitt has sued EPA for supposedly overbearing environmental regulations. It does not surprise me that Trump pulled out of the Paris Accord. And the funding of National Parks in the United Stations decreases dramatically now. Sophie al-Mutawaly studies Government and Pre-Law at Bowdoin College in Brunswick, Maine. 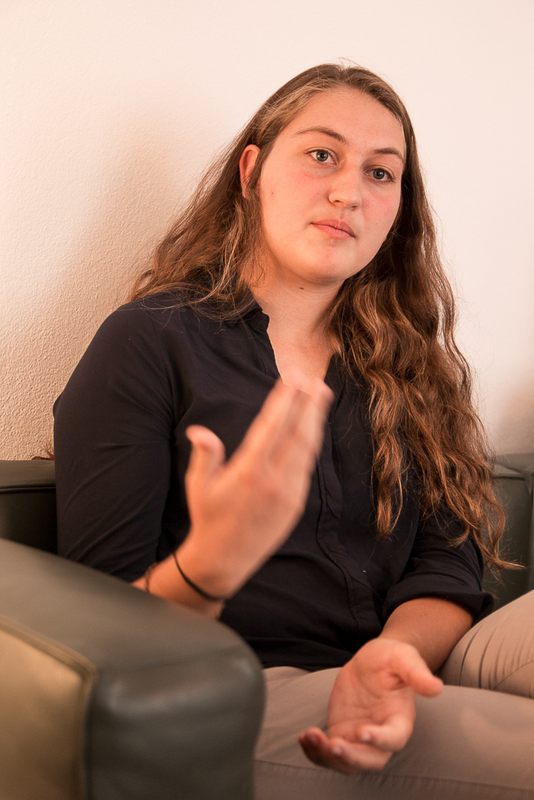 She is currently doing an internship with the law firm Rückel & Collegen in Munich. Sophie al Mutawaly: What also scares me is that Trump is getting through to people feeling left behind by prior administrations without a factual basis. One example is the travel ban on various countries: Trump claims all of the people from these countries are a danger to US citizens, which is not the case. Bernie Sanders was very passionate about education. He fought for the idea to make education more affordable for younger people. As a university student I really appreciate the work that Sanders did. Whereas Trump hurts the United States in various areas. Samuel Rahlke: There is one hope, though. Early on in his campaign, Trump was talking about improving our infrastructure. This is an old discussion. But for example, if you drive over the border from North Caroline to South Carolina the roads immediately and noticeably get worse with potholes for instance. If we could invest in that and invest in public transportation at least in metropolitan areas, the boom we would get out of increased logistics would be tremendous. Do you think NATO is still the appropriate instrument of foreign and security policy to guarantee the stability of its members? Samuel Rahlke: As long as Trump does not do too much with it, NATO at the current moment still has a bite. It is a great deterrent towards aggressive countries like Russia. It stands and has power. Krister Lansing: Trump’s America first policy is dangerous for NATO. It seems like the world has gone upside down. You are leaving your alliances with Europe and Canada to rot and on the other side you are making a deal with North Korea. You can’t do that to the expense of your old allies. Sophie al Mutawaly: Wanting other countries to get closer to the 2-percent-goal is not totally ridiculous of Trump to ask. Europe has to invest more into NATO to keep the alliance alive. The USA, the EU, Canada, China and Russia seem to enter a phase of deteriorating trade conflicts. What would a smart answer to President Trump’s punitive tariffs on steel and aluminum and may be on cars look like? Samuel Rahlke: It is important for the EU to impose a few counter tariffs to even out the deficit that is being created by the new US tariffs. They should leave it with that and make sure that their reaction does not exceed the US tariffs. It really comes down to Trump. If he wants to impose another tariff especially on European cars this would be the most unwise move. It would only escalate from there. It is going to set a precedent. It is going to go back and forth continuously. He would hurt the US consumer in the long run additionally to European companies. There is no added benefit to that kind of step. Krister Lansing: It is important that the Europeans let Trump have this win. This is political tactic being used. He made promises to his voters to stop outsourcing and bring back industrial jobs to America. If Germany and the EU fight back too hard, this leads nowhere good. People will finally see that these tariffs are unproductive. Sophie al Mutawaly: The response on the European side will really tell us how this relationship will move forward. Are you afraid of the effects that Artificial Intelligence will have on your working life? Sophie al Mutawaly: I don’t think that robots will replace lawyers (laughs). We are seeing all around us that jobs are slowly being replaced by robots and machines. Trump is trying to bring jobs back to the United States. In a world that is moving forward with this digitization it is going to be very difficult for him to keep that. Samuel Rahlke: As we see more jobs move to machinery and automated processes there is definitively going to be a decrease of people actually being employed. But with time, people will focus more on STEM fields which is science, technology, engineering, and mathematics. So, we are going to need more people who develop the machinery and more people who program these systems. 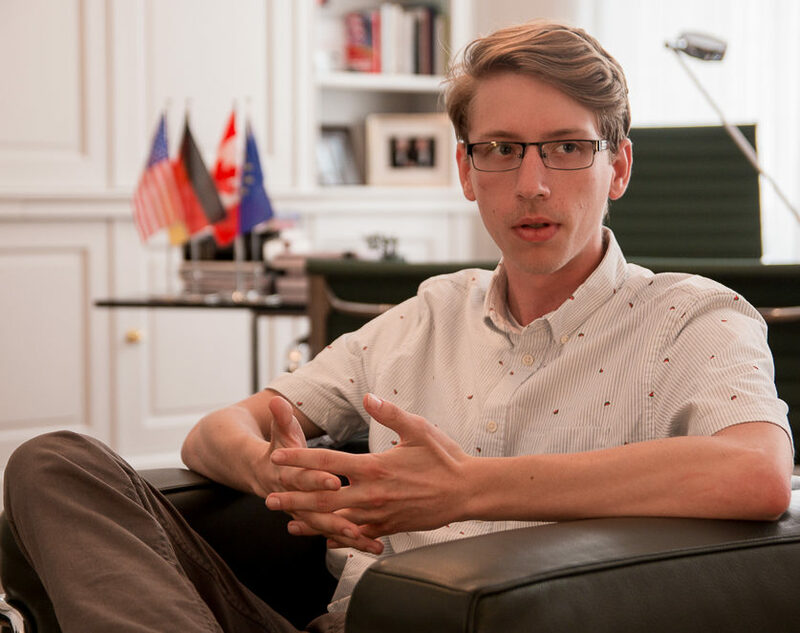 Krister Lansing studies Political Science, Global Liberal Studies and German at New York University. 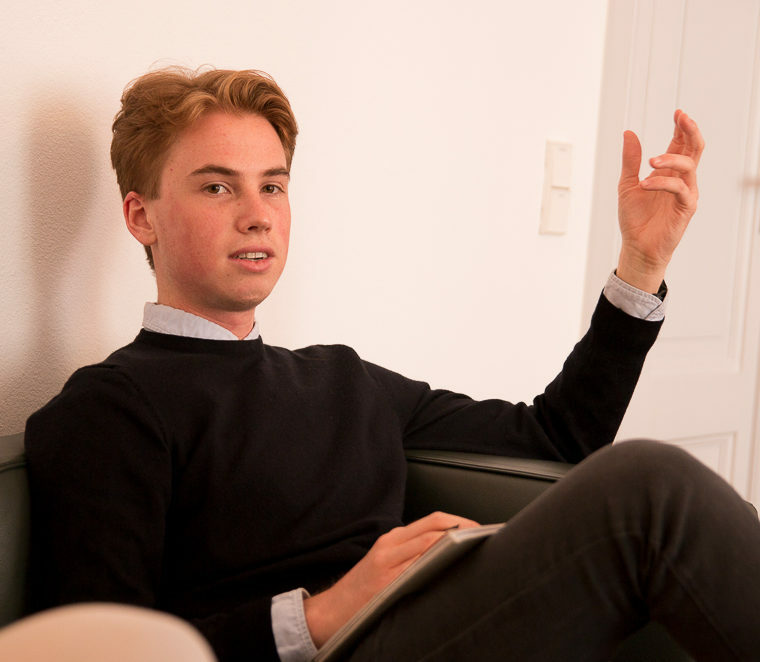 He is an intern with Deekeling Arndt Advisors in Berlin and Düsseldorf. Krister Lansing: I used to be a huge pessimist in terms of how Artificial Intelligence and automation of industries will play out on economies. But I admit that this is a misplaced fear. This process will simply rationalize some tasks like a document search which is quite tedious for a lawyer for example. What cannot be replicated is the abstract thought, argumentation, sympathy, emotion, and creativity of humans. It is more about a supplement and help for a lot of professions. What can Europe for its own sake learn from the U.S. presidential election of 2016 as to the socio-economic problems within the American society? Krister Lansing: Two things are really evident: The power of information and misinformation in elections and how professional politicians relate to their constituents. Hillary Clinton for example has often failed to give real answers and has shown a fluid value system. Politicians should talk honestly to the people and explain what needs to be done. It is also important how people inform themselves about what the country needs. Samuel Rahlke: It is also going to change the way people consume information about politicians. At least in America we will see less people looking at sources like Fox News, MSNBC or CNN. I think that people will use more information coming directly from the politicians rather than opinionated or interpreted coverage. Krister Lansing: Bernie Sanders really is a big pioneer in this development. He used technology very effectively with Facebook Live conversations and a Snapchat account on which he was sharing and documenting his events. Sophie al Mutawaly: Again: The youth needs to get more involved in politics and to be genuinely interested in what is going on. It is not enough just to complain about movements like Pegida here in Germany. Final Question: Is there still enough momentum in America to save the global climate although the current U.S. administration has announced its withdrawal from the Paris Climate agreement COP 21? Sophie al Mutawaly: Exactly the same day that Trump made his announcement, various states said they wanted to stay a part of this agreement. There was a lot of backlash also on an international level to what Trump was doing. The coal industry is definitively not part of our future. Samuel Rahlke: In the US, enough force can be generated by the population to encourage the current administration to get back in the Paris Accord. If we can get younger people to mobilize on this idea and to write to our representatives, there is still a chance to get back. This is a global effort which needs the American support. Krister Lansing: There is a lot of hope for climate protection. The private sector is doing a lot in terms of innovative technology. However, so many fundamental things like transportation industry and agriculture need to be completely restructured by a top-down regulation just as the Paris Climate agreement. Grassroot activists are not enough. The exchange students Sophie al Mutawaly, Samuel Rahlke and Krister Lansing are part of the current group of German-American Exchange e.V.’s internship program. Atlantik-Brücke-member Dr. Christoph Rückel chairs the organization. Their next event is the 9th German-American Business Day on July 16, 2018, at Literaturhaus München. At the event, short video statements by the students about their time in Germany will be shown. You can find additional information here.